Storm debris fills the yard of a Lakeland home. Hurricane Irma has left the state. Now, the cleanup begins. From downed tree limbs to damaged household items like appliances and furniture. Every city and county has its own guidelines for pick-up. Debris collection, rescheduled trash pickup and guidelines on how to handle the debris are listed below. Be sure to check what your service provider or local government requires. Debris should be put by the curb for pick up. Solid Waste will pick it up when they can on people’s regular trash, recycling and yard waste pick-up day. Do not put debris into the roadways or near fire hydrants. Normal Monday trash and curbside recycling will be picked up Tuesday, Sept. 12. Those scheduled for a Tuesday pick up should plan to have their trash and recycling out for pick up on Wednesday. Thursday and Friday pick-up services will be on their regular schedule. 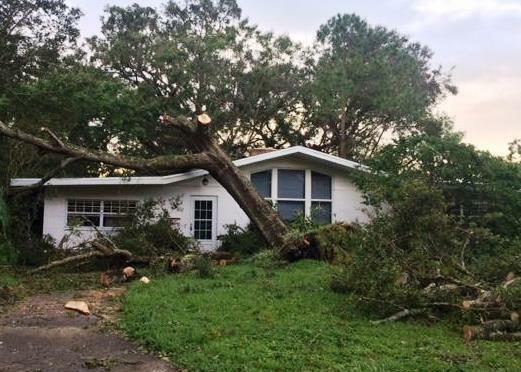 For trees downed in city right of ways, citizens should call (727) 562-4800 or email Michele.stewart@myclearwater.com. ST. PETERSBURG: City crews are working to collect debris from neighborhoods. Residents are asked to place tree limbs behind the curb, off the street, in front of the house. Don't mix-in other storm debris with the vegetation. No need to call, because city crews are working and will eventually get around to all neighborhoods next week. It may take several days. SARASOTA: No Residential garbage, recycling and yard waste collection pick up today/Tuesday. Residents are urged to separate storm debris and place it on the curb away from obstructions like mailboxes. The city is assessing cleanup needs, hire a contractor and set up a debris collection schedule. Trash pick-up resumed Tuesday, but the schedule is shifted by a day. So, trash normally picked up on Monday will be collected today. Tuesday's trash day is now shifted to Wednesday. Storm debris Trash pick-up collection will begin on Thursday, September 14, 2017 and continue through Friday, October 13, 2017. Debris should be separated by material type (i.e. white goods, construction material, vegetative debris) placed at the curb. McKay Bay Disposal Facility re-opened Tuesday and began accepting storm debris. As residents and business disposal of added debris, wait times are expected to be longer than usual. Storm debris free curbside pick up begins Monday, Sept. 18. Debris should be stacked on the right of way and should not be bundled. Do not place debris in the roadway. Yard waste facilities is open, however, regular prices apply for storm debris, should residents not want to wait for curbside collection. HILLSBOROUGH COUNTY: Residential garbage, recycling, and yard waste collection services resumes Wednesday, Sept. 13. Contracted yard debris collection for storm debris will start on Monday, Sept. 18. Residents should have yard waste placed in piles along the right of way for collection. Do not block access to storm water drains, utility boxes, or roadways. MANATEE COUNTY: No recycling this week. Trash will be collected on a modified schedule this week as long as roads become passable by the garbage trucks. Residents with Tuesday/Friday collection will have their trash collected on their normal days. Residents with Monday/Thursday collection will have their garbage collected on Wednesday and Thursday this week. Garbage collectors will only collect trash that fits inside your garbage can. Large items, debris, and yard waste will not be collected this week. Dates for storm debris pick-up will be provided when scheduled. Visit www.mymanatee.org/garbage for more information. If you have any questions, call (941) 792-8811. PASCO COUNTY: Debris removal starts the week of Monday, Sept. 18. Residents must have all debris materials brought to the curb or roadside for pickup. Do not bag debris, refrigerators should be empty with doors secured or removed. Do not to block fire hydrants, mailboxes, electrical boxes or any other structures. Contractor generated debris will not be picked up. Requests for debris pickup must be submitted to Pasco County Customer Service Center by emailing customerservice@pascocountyfl.net, providing the address where the debris is located. Residents can also call customer service at 727.847.2411. Furniture including mattresses, couches, sofas, chairs, dressers, lumber (if NOT pressure treated), particle board, laminated flooring, dry insulation (if wet, pile with construction), carpet & padding. Vegetation, tree cuttings no more than 5 feet long and all branches must be bundled. Hazardous Waste – Delayed Pick-Up of any household chemicals, oil, gas, flammables, lawn & garden chemicals, televisions, computer monitors, computer towers (CPU’s) . PINELLAS COUNTY: Debris contractors will begin neighborhood debris collection from the rights of way on Monday, Sept. 18. Residents should place their debris in sorted piles at the public right-of-way for curbside collection and do not block fire hydrants, storm drains or stack against poles or trees. Sort debris by item type into separate piles. Construction and demolition debris including building material including roof shingles and siding, drywall, lumber, carpet, furniture, plumbing. Uncertain if you're in unincorporated Pinellas or within a municipality, visit www.pinellascounty.org/resident/unincorporated_areas.htm. POLK COUNTY: Polk County’s hauling contractor, Crowder-Gulf Inc., has begun the lengthy and detailed process to comply with FEMA reimbursement guidelines, and should begin storm debris removal from public and private roads in approximately seven days. These debris-removal crews will be assigned collection priorities within unincorporated Polk County based upon highest impacted areas as determined by county officials. City liaisons will direct collection crews based upon municipal priorities. The City of Lakeland will collect and manage those efforts within their city limits with city resources. Normal collection days resumes Wednesday, Sept. 13, in unincorporated areas. If you have a small amount of storm related debris bundled or bagged as yard waste, it will be picked up on your regularly scheduled trash day starting Wednesday. The Sarasota County Landfill is open for trash and yard waste Monday-Saturday, 8 a.m. - 5 p.m. All fees are waived through Sept. 23 for vegetative storm debris residents bring in. Storm related debris pickup: Storm debris is not required to be bagged or bundled. Debris removal operations for larger debris placed near the right of way should start by Monday, Sept. 18, and continue until complete. Debris pickup may not occur on your normal collection day. Hernando County Emergency Management has coordinated with the Solid Waste Department to begin collecting debris caused from Hurricane Irma starting Monday, Sept. 18. It could take a few weeks for the county to get all debris, but officials say two sweeps will be performed throughout the county. Residents must separate debris such as tree limbs and brush from other construction/demolition debris. It should be placed in front of their property along the roadway. Do not place debris in the roadway. For people who choose to dispose of your storm debris before Monday, they are asked to NOT take it to the convenience centers. Convenience Centers cannot accommodate the weight and size of large storm debris and it will not be accepted. Instead, dispose of it at the Northwest Solid Waste Facility (Main Landfill) located at 14450 Landfill Road in Brooksville. Call (352) 754-4112 for more information. The main landfill location is open Monday to Saturday, 8 a.m. to 4:30 p.m.
Too much water is typically the problem when storms blow through Tampa Bay. 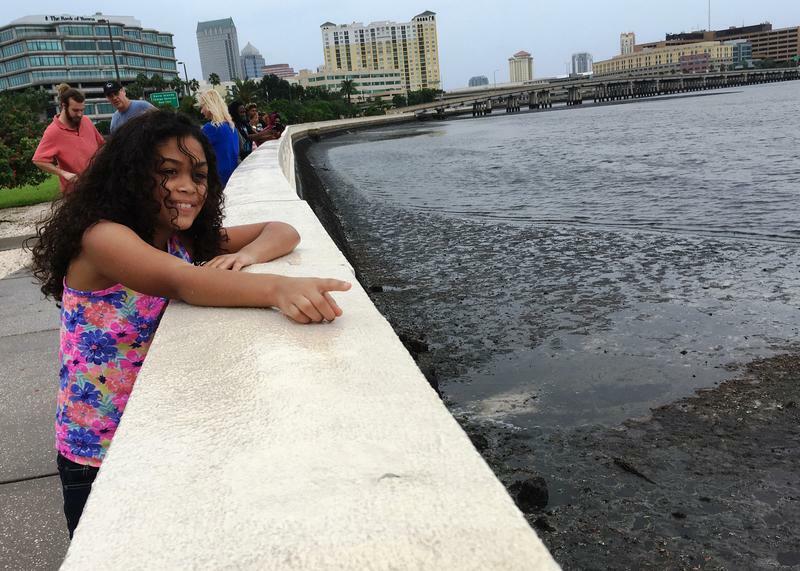 But for a few brief hours Sunday, the bay's fortunes were reversed as Hurricane Irma's counterclockwise winds blew the water out. Gov. Rick Scott visited the Florida Power & Light staging area at Southwest Florida International Airport on Tuesday. 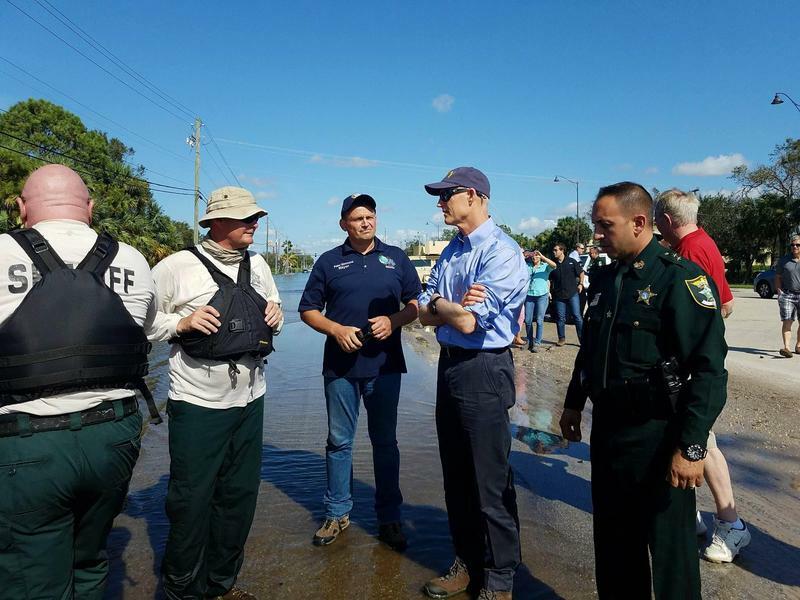 He also visited flooded areas of Southwest Florida. Utility trucks, prepping to restore power to the region were lined up far into the horizon. Scott briefly spoke to reporters about the power situation in the area. "I've been to shelters. I know everyone wants their power back," said Scott. "It's the biggest thing we can do right now, but we gotta be safe about it." 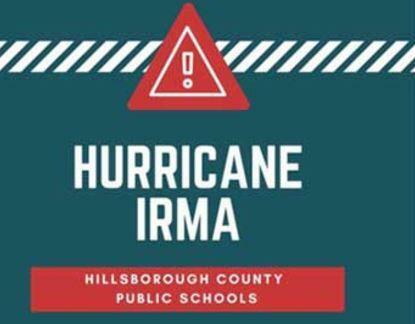 Many schools in the Tampa Bay area are just like residences -- no power. That means none of the schools will be open Tuesday. Some will be closed even longer.